OAKLAND, Calif. (AP) Dwight Howard was so good Friday night against the defending NBA champs that acting Charlotte Hornets coach Stephen Silas rode him to the finish line of a 111-100 victory over the Golden State Warriors. The Hornets won just their third road game of the season. Charlotte, beginning a four-game road trip, arrived with a 2-12 record away from home. Six Hornets players scored in double figures, led by Howard, who also had 12 rebounds and seven assists. On the night before the Warriors expect Stephen Curry to return from his sprained right ankle, they lost for just the second time in their past 15 games. They are 9-2 without Curry. Klay Thompson scored 24, 13 of them in the first quarter. Draymond Green had eight points, 11 rebounds and tied his career high with 16 assists. Kerr said the difference was an old story. 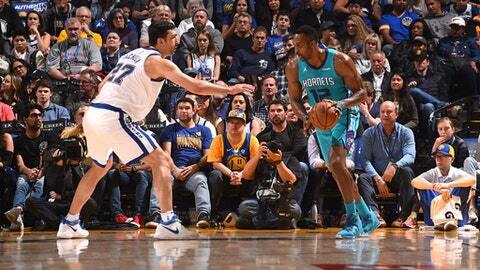 The league’s best third-quarter team, Golden State trailed 79-75 after the Hornets outscored them 26-22 in the third. Two nights earlier, the Warriors scored 42 third-quarter points to bury the Utah Jazz. It didn’t get any better for the league’s defending champs. Golden State got no closer than three points in the fourth quarter, and Charlotte’s lead reached 95-81 when Jeremy Lamb scored a layup off a feed from Howard to cap an 11-0 run with 6:30 left. Kerr said Curry likely will have a minutes limit, adding just his presence is a boost to the team. Hornets: Guard Kemba Walker, who leads the team with a 21.6 scoring average, entered Friday’s game mired in a bit of a shoot slump. He made just 37.7 percent from the field the previous eight games, including 29.5 percent on 3-pointers. He made just two of his first 12 against the Warriors, but warmed up to score 16 points. Warriors: Kerr seconded Green’s endorsement of Kevin Durant as a possible Defensive Player of the Year. ”To be mentioned in that conversation is a huge testament to the work he’s put in and what he means to our team,” Kerr said. Durant, a four-time NBA scoring champ, has blocked at least two shots in 10 consecutive games . F Omri Casspi sat out two days after spraining his right ankle against Utah. ”It’s not too bad. There’s not much swelling,” said Kerr, adding that Casspi could play Saturday against Memphis, but no later than Wednesday at Dallas. Hornets: Visit Los Angeles Clippers on Sunday. Warriors: Host Memphis on Saturday.